Ah ! Childcare available courtesy of Grandad Dennis and Nana Linda. What better way to relax than to bike to the pub. Well, biking to a load of caches and then biking to the pub, obviously. 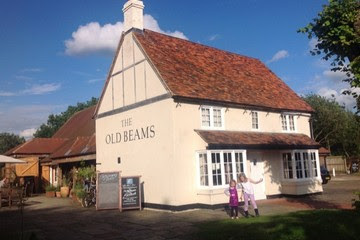 Our pub of choice was, as ever, the Old Beams in Shenley Lodge. It does good food and good beer, it’s only 10 non-caching minutes from home by bike and it has a very pleasant beer garden. What more could you need. And so to the caching. First up was 7SL by Urban Cacher. Can’t say what this is all about because it is a puzzle, but it is in Westcroft and it involves a bridge. Not saying which one….. It proved to be a cunning little beggar because bridges can always involve altitude issues. This proved no different. We started at the bottom and it wasn’t there. So we went up top, and it wasn’t there either. So we went back to the bottom and tried to get an exact fix on GZ – always difficult when standing under a bridge, but we eventually confirmed that GZ was definitely right here, in the middle of the path underneath the bridge. So we tried the bushes to the side but not with any great heart – they seemed too far away. And then, with a sudden flash of inspiration, Kev thought to look upwards and saw it straight away. All we then had to do was to go back to the top and figure out how to get at it. This is a nice cunning little cache. It’s been there for a while and we pass this spot but hadn’t noticed it before, but now we know it is there we now feel that it seems obvious and wonder how we could never have seen it before. I think it is one of those suspension-of-reality things. Your brain just fails to register it. Next up was Mission Impossible MK2: Shenley Brook End by Kitey. Further details are given in the Mission Impossible Mega-Blog but this one involves decode a chunk of text to reveal the coordinates. The powers of the internet mean this is one of the easier ones of the series. It also proved fairly easy to find once on site. A few muggles around but nothing too bad. Cool. Two finds in 15 minutes. East Green by Wavvy is the closest cache to the Old Beams. We had previously made a drive-by visit to pick up the required information. Calculating GZ was easy and the only problem is figuring out how to actually access that location from anywhere in Shenley Lodge. It’s fair to say it isn’t a high traffic area, and also fair to say that it isn’t easy to get a bike there. We parked up and walked the last 30 yards or so, but it proved to be a fairly easy find once there. All of which meant we had done 3 caches and it was still quite early. We therefore decided to push for a few more before retiring for drinks. Shenley Church End has a number of caches and convenient from where we were, so the die was cast. First was Dry Stream ? by Candy Mook. However, the iPhone couldn’t decide whether it was there or not and after a few minutes of mucking about we moved on. We would have been well advised to have a look. Kev returned solo on a different day and found it within seconds. Next was Kids n Dogs by Candy Mook. The coordinates place this in the middle of a pathway a long way from anything you could hide a cache in. Kas did find it eventually but it was absolutely nowhere near the coordinates. At least 20 yards away, I would say. Next up was Top Field SCE by Candy Mook. This proved a little more troublesome. It is within trees and we spent quite some time mooching about and trying to avoid suspicion due to high muggle count before we eventually concluded we would not find it. We moved on. We couldn’t possibly end on a failure so we went for a pop at Toot! Toot! by Wavvy. Erm ! Kas wasn’t dressed really for this one as it involved a muddy bit of field full of cow poo. We did, however, both get in there and get to it. It took a little while but eventually after some squelching, much checking of the GPS and a bit of spidey sense, we came up with the goods. After that one we had to give up because it was getting distinctly dark, and we were getting distinctly thirsty. So not a bad night, all in all. We obviously spent a good few hours at the pub quenching our thirst before scooting home. The kids were fine, the grandparents were fine, and all was generally well with the world.